I found his birthday cake stamp set (Wordsworth clear stamps) at my LSS over the weekend. I loved it because it was in a box ( for easy coloring and layers) and had an area for icing. The first thought that came to mind was to use liquid applique on the cake for icing. The back round paper and bottom strip is SEI Granny’s kitchen. I love the blues and browns. Look for a few more of these color combos this week and more liquid applique. I love that stuff! 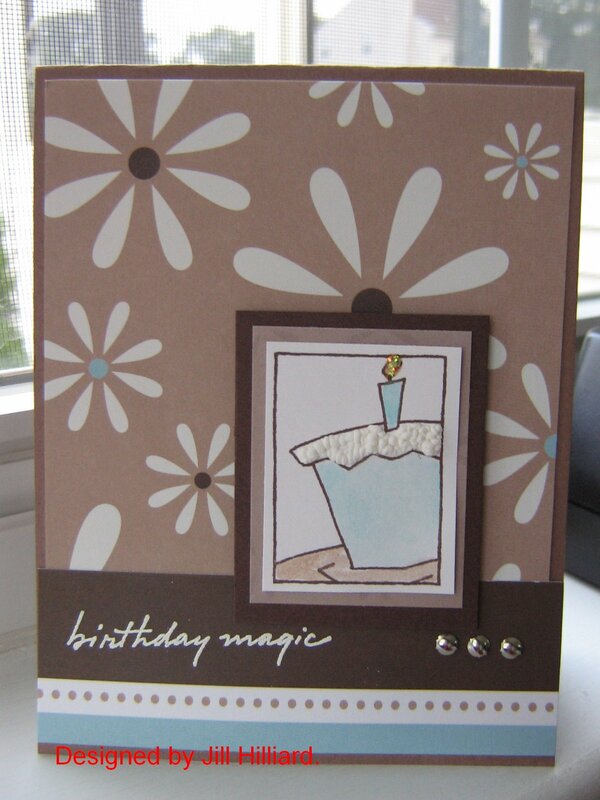 Other products on this card: SU close to cocoa card stock and ink, chocolate chip card stock, silver brads, sentiment is embossed in white embossing powder. Stickles on the candle for a touch of sparkle! SU watercolor crayons to color the image. Love the color combo! Great card!